James Cook University‘s College of Science and Engineering and College of Public Health, Medical & Vet Sciences, through myself and David Sellars, with the full support of Nikki Huddy from Planz, have been organising an Urban Thinkers Campus (UTC) framed around the topic of urban planning and design and public health. 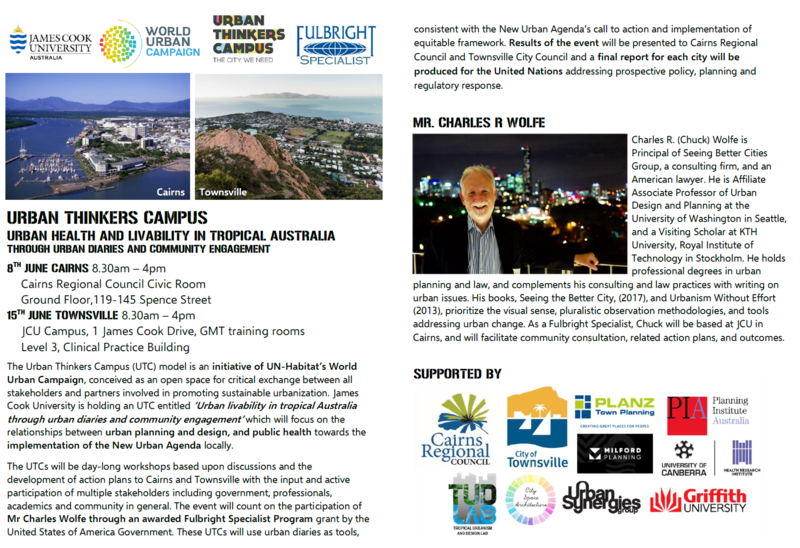 The UTC entitled ‘Urban Health and Livability in Tropical Australia through urban diaries and community engagement’ will take place on the 8th June in Cairns and 15th June in Townsville, and they are both day-long events (see preliminary schedule here). We have a number of supporters, including Cairns Regional Council, Townsville City Council, Planz Town Planning, Milford Planning, Planning Institute of Australia (PIA), TUDLab, City Space Architecture, Urban Synergies Group, and Griffith University. These will be two days of intense collaboration and practical work to come up with ways of implementing the UN-Habitat New Urban Agenda locally. We will have the support of Chuck Wolfe through his Urban Diary methodology and Seeing the Better City approach. More information on the flyer below.